Jeffrey T. Schnapp and Matthew Battles’s The Library Beyond the Book (Harvard University Press, 2014) is a multimedia publishing experiment that moves beyond slapping a CD of music onto a book’s inner front flap or uploading music onto a related web site. This book’s material is interlocked to material on a slew of media: a dedicated web site, a 24-minute documentary, relevant digital reviews about the film and Harvard’s MetaLAB in Harvard Magazine, and even a playable deck of cards (more on this later). This gothic disassembly and reassembly of the book’s traditional parts is intentionally disquieting–more Frankenstein’s monster than utopian order. Like Shelley’s monster, the volume questions its own narrative. It opens with a steampunk cartoon in which Melvil Dewey time travels from past to future, gleefully outlining the history of libraries and insisting on the library’s facilitation of dialogue between the living and the dead. The cartoon’s closing tableau reveals the domed reading room of the future library holding no books at all. Instead, an announcement from a loudspeaker informs Mr. Dewey that his volumes are “ready for download.” The Victorian Mr. Dewey is triumphant. The library of the future is here. is a provocation, not a description. It gestures toward a threshold being traversed at the time of writing, not toward an era when books will vanish and bookshelves will be seen only in virtual versions, brimming over only with e-books. The threshold being traversed involves dismantling the linear momentum of the book. The volume’s typographical design disrupts forward progress, in part through red-inked epigrammatic meditations on the future library that run down the right margin of each spread, forcing one to turn the volume 90˚ in order to read them. These future scenarios are deliberately whimsical, and reviewers have complained about the book’s abstractions. Though such complaints mistake theory for pragmatism, they are understandable given the legitimate anxiety about the future of libraries. Perhaps most whimsical is the companion deck of playing cards available for purchase upon request, on which the red-inked “provocations” are recorded. But here too the whimsy is richly informed. The deck recalls the organization of the first card catalog, designed by the historian Edward Gibbon on the backs of playing cards. Assumptions that these provocations matter, that they should be saved for posterity, that they should be the stuff of meditation are made frivolous by the medium of playing cards, even as we recall that playing cards are not only sometimes preserved in archives but also valuable for the insight they provide into the past. Gibbon’s card catalog provides one example; the famous playing cards narrating the fictional Popish Plot provides another. If items as apparently frivolous as playing cards should be collected and stored in libraries, where does the collecting end? The limitations of storing is the topic of the project’s highlight, the brilliant 24-minute documentary, Cold Storage, which is an improvisational tribute to Alain Resnais’ Toute la memoire du monde (1956). Toute la memoire du monde documented the organization of France’s beautiful Bibliothèque nationale; Cold Storage examines Harvard Library’s decidedly homely remote storage system. Both French and American documentaries dispel romantic concepts of the library, but a comparison of the two exposes the increasingly diminished role of the human in the highly functional and mechanized archival vaults of today. designed for the eyes of laser scanners, inventory tracking systems, and mechanically-aided acts of retrieval. . . . The HD reduces its sparsely-distributed human agents to parts in a cybernetic machine that speaks a language not of authors, subjects, and titles, but of barcode label identifiers and the ID numbers they encode (139). That laser scanners are now part of an intended audience is also suggested by the dust jacket designed for The Library Beyond the Book. An impossibly long barcode runs down the left side of the front cover, a hyperbolic indication of the book’s need to be “readable” by lasers in either Amazon warehouses or book depositories or both. The lifespan of the depository poses a problem that has always haunted libraries: finding space. Its climate controlled bunkers preserve books and other records for hundreds of years, but the concrete bunkers themselves will last between 70 and 100 years. With new books added to the collection’s 9 million items daily, the project is “unsustainable,” explains Matthew Shehy, head of access services. To the old, though intensifying, problem of sustainability is a new problem of concept, one that Battles suggests in his earlier volume, The Library: An Unquiet History. The machine-controlled bunkers of the HD force a reassessment of the beautiful and coherent religious metaphors we often use for libraries—”cathedral,” “monastery,” “hermitage,” and “refuge.” In those spaces, humans could collaborate with texts and others to construct a sustained cultural memory and identity. By contrast, the bunkers of today contain numbers of texts growing so quickly that not only cataloging but also comprehension seems beyond the scale of human minds. Everyone should watch Cold Storage for its creepy revelation of the non-human design of the very institution on which we rely to preserve, celebrate, bemoan, and understand the human record. For all its irreverent play, this multimedia project makes a serious point, leaving us to consider how best to respond to a monstrous body that was designed with the latest technology without full consideration for its place in human society. This entry was posted on August 9, 2015 at 6:13 pm and is filed under Digital Humanities, Digital Literary Studies, Digital Public Library of America, Digital Tools, DPLA, Harvard Metalab, Libraries, Reference Rooms, The Library Beyond the Book. You can follow any responses to this entry through the RSS 2.0 feed. You can leave a response, or trackback from your own site. 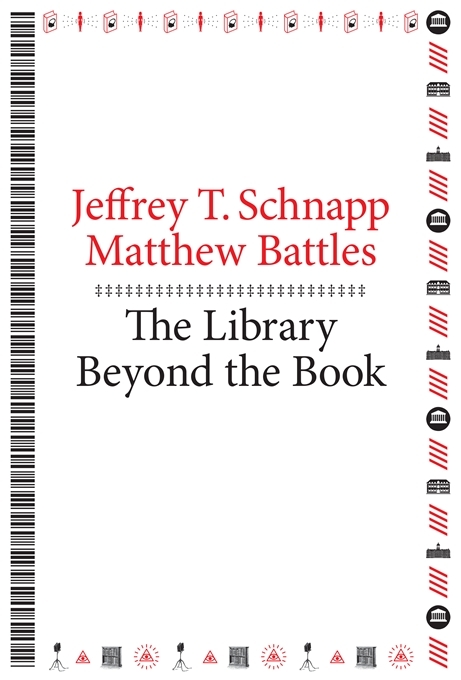 Many thanks, Anna, for this incredibly rich posting on Jeffrey T. Schnapp and Matthew Battles’s The Library Beyond the Book. Their work is far more intriguing (and admittedly serves a different purpose) than John Palfrey’s highly readable, quite straightforwardBiblioTech: Why Libraries More Than Ever in the Age of Google (2015). So much is of interest in your point, but for now I will comment on only a few points. While depicting a different stage of technology, Cold Storage nonetheless made me think of the underbelly of the Library of Congress and its conveyor belt delivery systems. As this image conveys, the system dates back more than a century ago. reports, the LoC’s system breaks about every month, and the company that manufactured the conveyor system is no longer in business, making repairs even more difficult. No funds seem to exist to replace this mechanism at any time soon. That books in the Harvard Cold Storage system are shelved by size, offers another return to early times in the history of the book when size served as the organizational logic of books. For much of the eighteenth-century, auction and sales catalogues still grouped books according to folio, quartos, and so forth. Finally, the publishing experiment that Schnapp and Battles offer reminds me very much of JJ Abrams and Doug Dorst’s novel S. (2013) that I will be discussing in a future post. It is not, I should stress, a multimedia book; it lacks videos, audios, and more. In many ways a paean to the written word–the printed codex–its production could not have been possible without digital tools. Like Schnapp and Battles’ book, it requires readers to perform physical gymnastics of sorts to read. Your comment that the “volume’s typographical design disrupts forward progress, in part through red-inked epigrammatic meditations on the future library that run down the right margin of each spread, forcing one to turn the volume 90˚ in order to read them” could easily be applied to this work with its various forms of handwritten marginalia and inserted items (often that require additional reading). I have note even touched on the implications that their work carry, but will do so later this week. In the meantime, I would very much like to hear what others think. Thanks, Eleanor! The LC’s conveyor belts add to this picture of the library’s groaning under the weight of our book and archival history. I have ordered S and will read it with interest. I found the warnings about the ebook version interesting. I’m glad you mentioned Palfrey’s BiblioTech (which I read in its Kindle format). It presents a much more optimistic point of view than Schnapp and Battles do of the digital future as the solution to the library’s storage problem. the powerful core idea is to focus less on books per se and more on knowledge transfer within a community. This emphasis on “knowledge transfer” seems to overlook the need for complexity in full understanding. Libraries need to recast themselves as platforms rather than as storehouses. By “platform” I am referring to the easy, effective access to information and knowledge that libraries provide. This isn’t a concept of library that seems particularly helpful for scholarship in the humanities, though it might well be efficient for other uses. Just got my copy of S. It’s beautiful! I’m already well into this other publishing experiment! Glad your copy of S arrived–it is incredible and thought-provoking. Palfrey is much more optimistic (I have not read Schnapp and Battles’ work yet, so I am making this comparison on the basis of your post). That’s no doubt why Palfrey chose the term “platform,” and why he uses”knowledge transfer” rather than “information transfer,” the later of which denotes unprocessed data, often decontextualized. Yet I took his use of platform as borrowed from computer lingo and signaling an environment suited to dynamic action in which “applications can be run.” This verbiage admittedly doesn’t seem that inviting, but it does signal activity and energy that corresponds to my love affairs with the archives. Yet, I am more troubled by what follows; “the easy, effective access to information and knowledge that libraries provide” seems to misunderstand the value and methodologies of humanities scholarship. Finished S. Hope you post on it! It’s beautifully produced. Stay tuned for that post–waiting for another text to arrive to combine with a discussion. In fact, I have two more posts in the works ahead of the one on S. Part 2 of Digital Projects on SHARP to be posted today.